A healthy chocolate indulgence, this easy no sugar recipe for homemade chocolate yogurt is made with creamy Greek yogurt and cocoa powder. This chocolate yogurt recipe is so easy, it hardly qualifies as a recipe! I make it almost daily – it’s my favorite after-dinner dessert. It feels good to eat something so tasty, so indulgent, and so healthy. Scroll down to the recipe card for the detailed instructions. The idea is simple. Take some creamy Greek yogurt. Add unsweetened cocoa powder and your favorite sweetener (I use stevia glycerite). Add just a bit of water, especially if your Greek yogurt is very thick. Then, with a spoon, slowly mix everything together. Once fully mixed, I like to let the homemade chocolate yogurt rest for about 30 minutes at room temperature. This allows the flavors to meld and dissolves any remaining stubborn cocoa powder. Then, I give the yogurt one more mix, and dig in! So since I make this chocolate yogurt recipe for my after-dinner dessert, I usually make it before we sit down to eat our dinner, then let it rest. There seems to be controversy around this. Personally, I eat a moderate carb diet, so plain unsweetened Greek yogurt is fine with me. One can argue that plain unsweetened Greek yogurt can indeed be part of a ketogenic diet. This recipe has about 13g carbs and 4g fiber per serving, so it’s ultimately your decision whether you can fit in into your diet. Why not just buy chocolate yogurt? Most commercial flavored yogurts are very sugary. And flavored commercial yogurts, even the high-quality ones, often contain additives such as flavors, pectin, gums, and lecithin. “Light” flavored yogurts are often made with potentially problematic low carb sweeteners such as sucralose, plus a host of additives, including modified corn starch, flavors, acesulfame potassium, and potassium sorbate. What type of yogurt to use in this chocolate yogurt recipe? I use plain whole milk Greek yogurt. I especially like Straus yogurt. It’s wonderfully thick and creamy, just like sour cream. However, it’s very high in carbs compared to other whole milk Greek yogurts. So I often end up using Fage yogurt, which is also excellent. The nutrition info below assumes Fage Greek yogurt. If you prefer to use low fat or nonfat yogurt, that’s fine. It won’t be as tasty, but it will still be very good. Do keep in mind that whole milk dairy is healthier than low-fat dairy. Why not use regular yogurt? I use Greek yogurt in this recipe, then sometimes I add a bit of water, especially when the yogurt I use is very thick. Even with the addition of water, the chocolate yogurt is still very thick and creamy. Regular yogurt is too liquid, so I don’t like it, and especially not in this recipe. The idea is to get a mousse-like consistency, and you can’t achieve that with regular yogurt. What sweetener to use in this chocolate yogurt recipe? I use stevia glycerite. I really like this sweetener. It’s healthy, it doesn’t cause me abdominal distress like sugar alcohols do, and the glycerite formulation is not as bitter as other stevia products. The amount of stevia I use equals about 2 tablespoons of sugar. So you can try replacing the stevia with your favorite sweetener. If you use a granulated sweetener, I recommend using a powdered sweetener. If you use honey, you can probably use just 1.5 tablespoons, since it’s sweeter than other sweeteners. And if you use maple syrup, it’s possible that you won’t need to add water at all. So check the consistency and decide. Isn’t that a lot of sweetener for one serving? Yes. Two tablespoons of sugar (or its equivalent) per serving is indeed a lot. But the sweetener in this chocolate yogurt recipe needs to balance out two very acidic/bitter ingredients. Greek yogurt is quite sour, and cocoa powder is bitter. You can try using less sweetener, of course, and see if you like it. What cocoa powder to use? 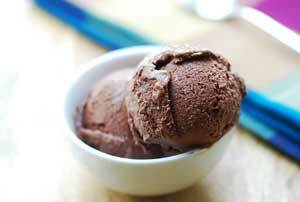 I recommend using unsweetened Dutch-processed cocoa powder, which is cocoa processed with alkali. Dutch processing makes the cocoa powder milder and darker. Natural cocoa powder is more acidic. It’s not that this chocolate yogurt recipe won’t work with natural cocoa powder. But it’s tastier with alkali-treated cocoa powder. Much like the nonfat yogurt dilemma, the dilemma here is that natural cocoa powder is healthier. But the Dutched cocoa powder is still healthy – just less so than natural – so I choose it for its mild, smooth flavor. I really like Greek yogurt and use it in many recipes, including Greek yogurt deviled eggs, Greek yogurt pancakes, and Greek yogurt cake. I find that Greek yogurt adds wonderful texture to baked goods. Add the cocoa powder and your sweetener. With a spoon, mix slowly and thoroughly, until mixture is uniform and creamy. If the mixture is too thick, mix in a tablespoon or two of water. 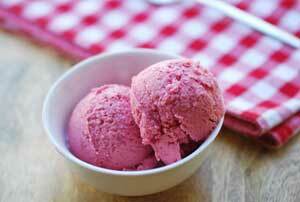 Let rest at room temperature for 10-30 minutes, to allow flavors to meld. Mix one more time and dig in!